So, the other day, I was looking over my schedule for the next few weeks and I realized that I'm headed back to Chicago in three weeks to climb the Sears Willis Tower with my brother. My brother recently lost 80 pounds via a trainer and the stairmill. Earlier this year, to celebrate, we did a stairclimb in a local "skyscraper." (Must put "skyscraper" in quotes - it's huge for Chicago's suburbs, but not so huge in the grand scheme of things.) 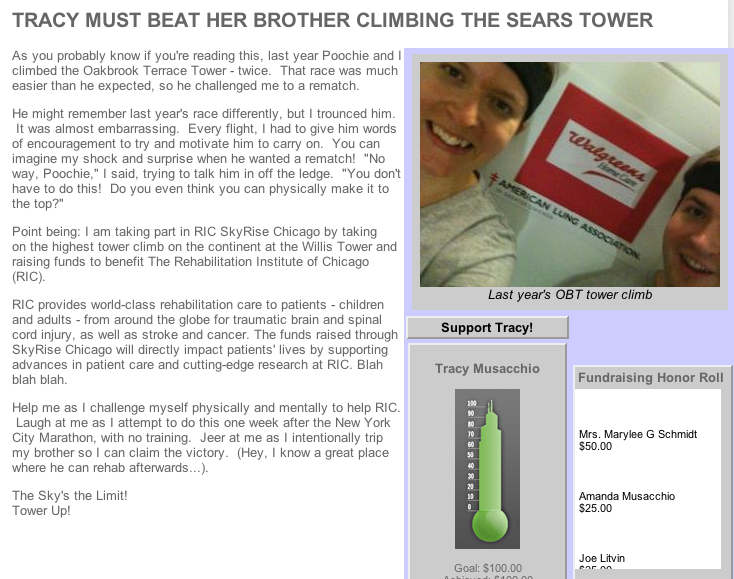 Given how much easier that race was than he expected, my brother decided that this year we're climbing the tallest building in Chicago. -"Crap, I should really, really train for this thing!" When I did the stairclimb last year, I was just a few weeks off of having run up the Empire State Building. I can't say that I totally rocked that race, and I can't say I prepared, but I had invested some time on the stairmill beforehand. This time around, I've done nothing specific to prepare. I haven't even taken the stairs up to my fifth floor apartment or my fourth floor office in about six months. Sad but true. I haven't seen the inside of my gym in at least two months. My brother, on the other hand, does an hour on the stairmill at least once a week. I guess I'll let him have the "victory" on this one; he's earned it. He tells me that this plan is to run next to me the entire time until there are only one or two floors left, and then he's going to sprint ahead and beat me. That plan does tend to work better with an element of surprise, in my experience, but we'll see what happens. Of course, since I've procrastinated, plane tickets for that weekend are inexplicably expensive. Big problem with living in NYC and attempting to travel on Friday evenings/Monday mornings: evidently, loads of people like to do business here (who knew?) and the planes fill up! It's not a race! They stagger the starts so that everyone starts 7 seconds apart and it's absolutely just a "fun run"! Not a race! Not a race!! Southwest has a deal on flights today/tomorrow. Check em out! also wanted to mention that i struggle with low ferritin as well. my mom, a nurse, suggested Floradix (available at like Vitamin Shoppe) http://www.floradix.net/ its the iron and herbs. works amazingly well. i sleep 7-8 hours and am not tired anymore!